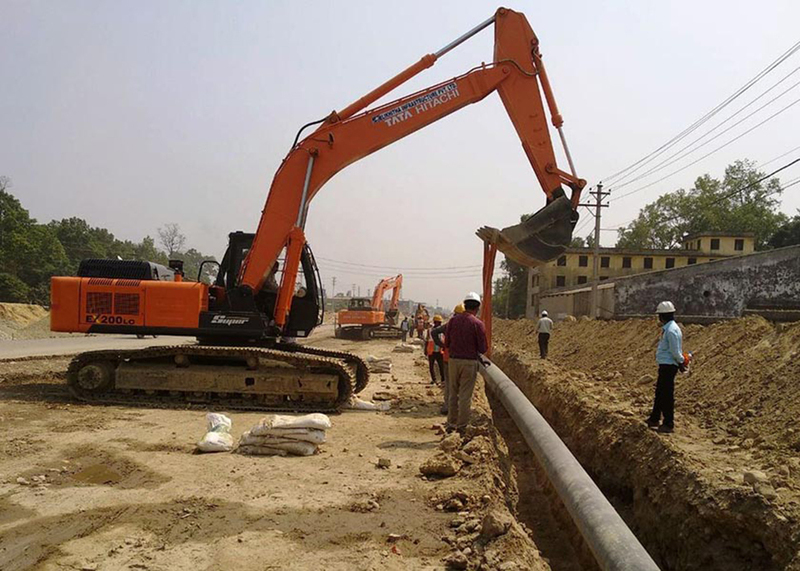 Republica Work to lay down pipeline underway at Amlekhgunj. KATHMANDU, Nov 14: Nearly 50 percent of works related to laying petroleum pipeline between Nepal and India have completed in seven months since beginning of the construction work. According to the Nepal Oil Corporation (NOC), 19 kilometers pipeline out of 37.35 kilometers between Indian town of Raxaul and Amlekhgunj of Nepal have already been laid. He progress in the much-awaited cross-border pipeline comes as a relief for the government at a time when most of the other development projects have been facing persistent delays. Bhanubhakta Khanal, coordinator of cross-border pipeline project, said that the work progress of the pipeline construction project is satisfactory. "Nearly 50 percent of the pipeline has been laid down. The target is to complete the project by mid-February,” he said, adding that preparation was underway to bring the pipeline into operation by mid-March next year.Indian Oil Corporation (IOC) is building the project. Though delay in getting permission to fell trees from Parsa National Park was affecting the project earlier, the pipeline project started getting momentum after it got the go ahead to cut down 5,888 trees following environmental impact assessment. The NOC will provide compensation to the National Park to plant 25 saplings for every tree felled. Similarly, the project is also speeding up work to build a petroleum products storage facility at Amlekhgunj. “The storage facility will be connected to the pipeline. Works on both components of the project are moving ahead simultaneously,” he added. 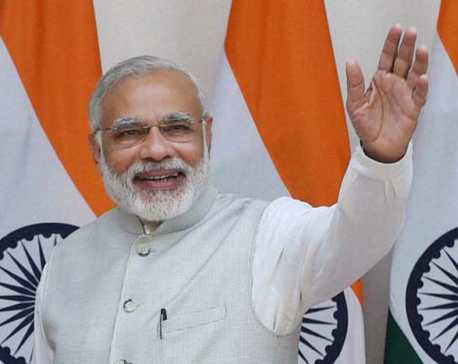 The petroleum pipeline project was launched jointly by Prime Minister KP Sharma Oli and his Indian counterpart Narendra Modi on April 8. During Nepal's Prime Minister Oli's state visit to India, the duo participated remotely in the ground-breaking ceremony, marking a formal start to the pipeline laying works. The project is estimated to cost. Nepal is investing Rs 1.2 billion, while the remaining fund will be invested by India. Though the cross-border pipeline project was first conceived in 1995 through a memorandum of understanding signed between IOC and NOC, the two countries signed an agreement for the same in August, 2015.Once it is laid, the pipeline is estimated to reduce fuel transport cost by 40 percent, something that is expected to greatly relieve Nepali consumers. Trade experts estimate that Nepal can save roughly over Rs 1 billion annually in transport cost and reduced technical loss once the pipeline comes into operation. Though the project was initially meant to construct a pipeline from Raxaul to Amlekhgunj, this was later extended to Motihari after IOC shifted its depot from Raxaul to Motihari. Nepal has been requesting the Indian government to extend the pipeline to Kathmandu from Amlekhgunj. The NOC is so far ferrying petroleum products from India through nearly 1,900 tankers. The compulsion to import petroleum products through tankers will end once the pipeline comes into operation in mid-March next year, say NOC officials. The pipeline is targeted to pump 200,000 liters of petroleum product per hour to the Amlekhgunj depot.